At this moment, I am spooning giant scoops of ice cream from a tub of Edy’s slow churned Rocky Road from my freezer, drowning it in sprinkles and eating it compulsively, my head cradling the phone as I eat. I am listening to him, but it’s all just words; the same old tortured words of a tortured existence. Today’s problem of the day has gotten itself pregnant and is now two problems. He has no protection from himself, so there is always the risk of multiplication. During conversations like these, I am unable to keep the spoon out of my mouth. Luckily his diatribes need no response. He can talk on and on about his suffering with almost no interruption, leaving me free to torture myself. I see his form, even though he is over the bridge and I am through a tunnel, sitting awkwardly on his bed; his face drooped as low as his body. The cigarette held carelessly in his hands. Smoke floating up past his glazed over eyes; the ashes falling on jeans riddled with the cigarette holes of frustrated days gone by. He might fall asleep like this if he stopped talking. He might fall asleep even if he doesn’t. My spoon scrapes bottom. My stomach is extended, my heart divided. I reach for the tub again. It calms something out of control inside of me which threatens to explode in these conversations, but with every bite I grow angrier with him and with myself, so instead of being soothed, I boil. “I want to stop talking,” I hear him say, his voice a cloud over my head. I want you to as well, I don’t reply. “I know I’m talking too much.” He repeats. The recognition is brief. It is hard for him to focus on about anything but himself and his pain for anything more than an acknowledgement. Yet, he pauses to ask how I am; which should be considered some kind of progress, even though it’s fleeting and not quite genuine, because I know it is difficult for him. I could interrupt and fill the space with my noise, but my tongue is numb and I can’t muster the effort to even pretend to be normal tonight. So, on he goes, moving without transition from one problem to another, one pain to the next. I have heard enough to last ten lifetimes. Still, he can’t stop talking. I can’t stop spooning. And we both can’t stop hating who we are at this moment. 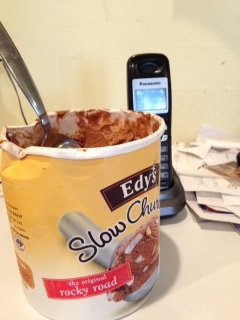 Posted in Dad, Ice Cream and tagged care taking, caring for older parents, depression, Edy's slow churned ice cream, ice cream. Bookmark the permalink. Such good writing. So painful. Wow. thanks. wasn’t a great moment. i’m kind of used to it, and never get used to it at the same time. I really do love your writing. It is beautiful. So difficult…sorry. writing itself was excellent even though topic so painful. thank you. honestly, writing it out really does help and then it’s over and i feel better. this makes me a little sick to my stomach – your writing is very powerful!!! it’s not great, but it’s cathartic for me. Oh, hon. I recognize this. Sigh. Sending you an internet scoop. Well written. SO many great little bits *sprinkled* throughout. It’s good of you to listen, nonetheless. I love that “there’s always the risk of multiplication.” Well done! My weakness is cookie dough and I can spoon that stuff down. I hope things are better now! can’t argue cookie dough.. especially in ice cream. Oh I just want to reach through this computer screen and hug you right now.